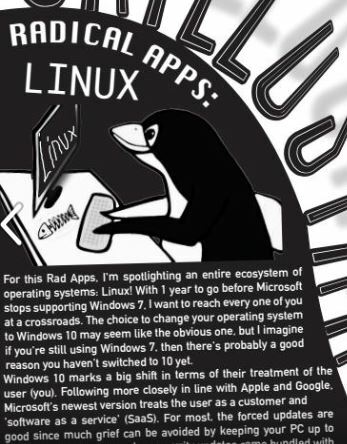 For this Rad Apps, I’m spotlighting an entire ecosystem of operating systems: Linux! With 1 year to go before Microsoft stops supporting Windows 7, I want to reach every one of you at a crossroads. The choice to change your operating system to Windows 10 may seem like the obvious one, but I imagine if you’re still using Windows 7, then there’s probably a good reason you haven’t switched to 10 yet. Windows 10 marks a big shift in terms of their treatment of the user (you). Following more closely in line with Apple and Google, Microsoft’s newest version treats the user as a customer and ‘software as a service’ (SaaS). For most, the forced updates are good since much grief can be avoided by keeping your PC up to date. But what happens when security updates come bundled with opaque and comprehensive data collection? Microsoft can implement any changes it wants—whether placing ads in your start menu, installing unwanted programs (apps) on your computer, or changing your preferences to get you to use your computer a particular way. Who can stop them? They still control the dominant PC OS market with only Apple as the next largest option. Let me recommend Linux as an alternative as it’s more stable, stronger, and easier to use than ever before, not to mention free to use and open-source with dozens of different versions available. I personally use Ubuntu Linux because it’s simple and convenient, but if Canonical (the company that supports this distribution of Linux) ever starts getting overbearing, I can pretty painlessly jump to a different ship. If you feel apprehensive, ask a local geek for help. They may be willing to swap talent to help you out! You’ll have to leave Windows 7 soon, so why not leave Windows altogether?